Over the past 10 years you have probably been to an event where our Hog Roast catering team was spit roasting. From our two locations we regularly delight wedding guests throughout the UK with local produce working with clients across the counties of Hampshire, Surrey, Berkshire, West Sussex, East Sussex, Kent, London, Wiltshire, Dorset, Berkshire, Hertfordshire, Oxfordshire, Gloucestershire, Somerset and Devon. The sight and aroma of a genuine Free Range roasting hog, turning slowly on a Hog Roast Spit, always draws an appreciative crowd. 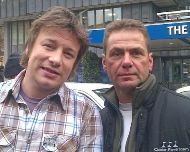 I am always delighted when chosen to work with and supply equipment services to TV celebrity chefs including James Martin, Brian Turner, Jamie Oliver, Hugh Fearnley-Whittingstall, Marco Pierre White, Gordon Ramsay and Heston Blumenthal to name but a few. We are the original specialists in Hog Roast and BBQ Wedding Catering. We promise to provide a Hog Spit Roast catering service that creates a talking point and a delicious taste experience for your guests. In a sector of the catering industry which has its fair share of cowboys, you can trust the Hog Roast Company with 10 years experience, a family business, high standards and professionalism to deliver any Hog Spit Roast or Wedding Menu to perfection. When you choose The Hog Roast Company to cater for your event you can be sure that our prime hog roasts are Farm Assured Local Pigs. You can be confident that we abide by the highest catering practices and comply with all the latest Food Regulations. In fact, we are among only 10% of caterers to achieve an "Excellent" after our most recent food hygiene inspection. Our local free range hogs are delivered in refrigerated vehicles from Plantation Pigs, Blythburgh Free Range Pork or our own Pig Farm in Wiltshire. All our meat is then hung in our own purpose built lamb and hog roast refrigeration units prior to delivery to your event. We can handle any catering event whether it's a Wedding, Birthday Party, Product Launch, Company Celebration, Film Location, Charity Fundraiser or Public Festival. We are regularly contacted to provide quality catering to prestigious clients and working for or with various TV channels and TV chefs. Recently chosen from all the outside caterers in the UK to work alongside TV Chef Brian Turner to provide breakfast for 840 guests. We are a friendly, reliable Hog Roast Company and our goal is to make your event a real success with our sizzling hog and pig roasts giving your event the wow factor with a tasty free range centrepiece. As well as our fabulous hog roasts we provide a broad range of wedding and party event services for every occasion - browse our site to find out about our comprehensive outside Catering Services and Hog Roast Equipment Hire. River Cottage TV Celebrity Hugh Fearnley Whittingstall with the boss Peter Stuart.